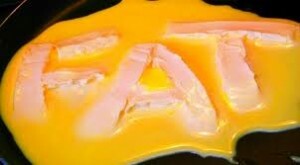 The Good Fats and the Bad Fats Facts! Everyday in the news is some information about the fat. We all need it, we all eat it. Here’s a simple guide to fats, the good, the bad and the ugly. First realize that fats are a necessary part of any diet. We need fats to make hormones, build and repair tissues, and for energy. Gram per gram, fat provides about more than twice the energy of carbohydrates (9 calories per gram vs 4 calories per gram for carbs). Fats also help us absorb certain vitamins and satiates our appetite more than carbs or protein. But there really are good fats and bad fats and the Cliff notes version of this column is this — if a fat is solid or semi-solid at room temperature, you should avoid it. Most dietary fats fall in to three categories: Saturated fats, polyunsaturated fats, and mono unsaturated fats. Diet and exercise is a lifestyle choice. Once you decide to get fit, staying fit becomes your biggest challange. A few tips from health expert Bob Greene will keep you on track while maintaining your fitness goals. The best life diet, the creation of physiologist Bob Greene, has an easy-to-follow approach to weight loss and healthy living. This diet plan calls for lifestyle changes as well as healthy eating habits. This best life diet does not include physical activity and exercise as primary forms of weight loss, instead, promotes nutritious and healthy eating. Depending on the person’s physical conditions and general fitness, the best life diet suggests a calorie intake of about 1,500 to 2,500 based on the list of recommended foods and their number of servings. This easy-to-understand weight loss diet is very effective, and Oprah Winfrey is one of its success stories. There are a wide range of recipes, tips, and tools for the dieters to keep on track and stick to diet regime. The best life diet can be customized further to suit various body types as well as different lifestyles. This may include different food choices and activity levels of the individual. The main feature of the plan is controlling food choices, portions, and serving sizes and numbers. A lot of liberty regarding food choice is given in the third phase of this diet plan. The diet also guides an individual about basics of food and about how to replace unhealthy foods with similar-tasting healthy foods. The diet educates individuals about trans fats, soft drinks, high-fat dairy and other foods that they should avoid. Another interesting fact is that Greene has placed a best life diet seal on various food products so that the dieters may not have any confusion about what food they may or may not eat.